Our previous video tutorial showed most of the various features of Imaris Measurement Points. This tutorial describes how to place Measurement Points on a specific plane when it lacks any created object such as Spots, Surfaces or Filaments or even high intensity voxel. 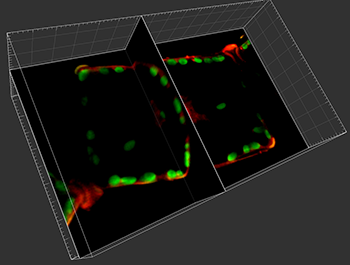 Ortho and Oblique slicers are ideally suited for this task. 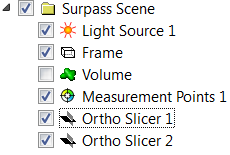 To start adding measurement points on a specific plane, first, add new Ortho Slicers in the Surpass scene and an orthogonal plane appears in the viewing area. Please note, within the Measurement Points tool, any added Surpass object is considered to be a Solid object. To provide an unobstructed view, switch off the Volume rendering. 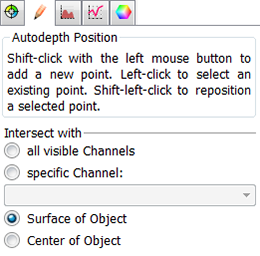 Then, switch to Measurement Points and under the Edit tab select the Surface of Object option. 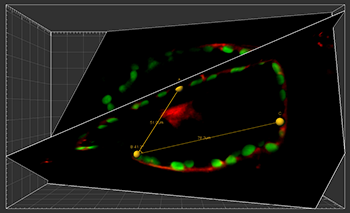 Set the pointer to Select mode, adjust the size of the 3D cursor box and start inserting measurement points by holding down the Shift key and clicking the left mouse button at the location of your choice. A line connecting the two points is created and the measured distance and angles between the two structures of interest is displayed. 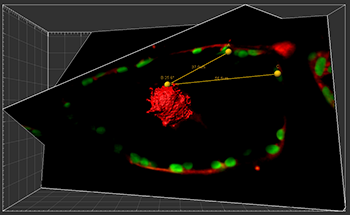 Similarly, the Oblique Slicers can be used to re-slice the image and place measurement points at the desired location. The Oblique Slicer can be moved and rotated to any desired angle, allowing complete control over which portion of the image is visible. By moving the thinner spindle with your mouse you can freely rotate the Oblique Slicer. 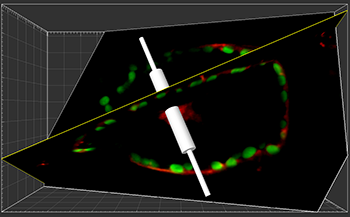 And by moving the thicker spindle you can adjust the position of the Oblique Slicer within the image. Adjust the position of the slicers and following the same process insert measurement points. 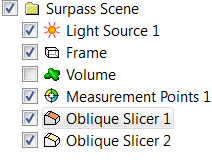 In addition, measurement points can be inserted between the Oblique and/or Ortho slicer and any created objects. By doing so you can measuring the distance between non-segmented structures of interest and any Imaris created objects. If you have questions about these features or any other features found within Imaris, please contact our Sales or Support team.